Travel as a Practice to Accept Yourself. Authentic travel is a perfect set up to learn to accept yourself — which is a working stage of self-development. While you are on the trip of self-discovery traveling through physical space, travel within is a necessary step for opening yourself up to change. Perhaps driven by desire to change and curiosity about a different way of being, you plunged away from the comfort of your habitual life supported by network of people and circumstances. With the departure, you embraced the spontaneity of how life really is: constantly moving and changing, flowing beyond your control. Typical modes of being that worked in the past will not offer enough cover from exposure to face the world and the inevitable opportunity for courage to accept yourself will be up in your face. Authentic travel is a travel for empowerment. When you are on the journey alone, memories will rise up. Your attachments will create feelings of loneliness, perhaps regrets and self-judgments. Distant situations from the past will bubble up to the surface of your mind for a review. By the nature of travel you will leave activities of distraction along with habitual environment that served as a circuit of behavior under control. In that environment, there could have been the feelings and suppressed parts of yourself that were buried alive. Those parts and feelings could be seeking an audience with you, while the mechanism of control is loosing its grip due to new circumstances rising in unfamiliar space. It is a practice ground for accepting yourself. Self-acceptance in travel is not the same as careless bon vivant attitude or denial abetted by the excitement of transitory sense of spaciousness of peregrination. Self-acceptance is not a careless wave of a hand to all that is not here with you in exuberant run of reckless abandon. It is not intellectualizing your feelings. To accept yourself is to consciously shift your attitude toward yourself. Solo travel is a perfect healing opportunity to work the process of self-acceptance. 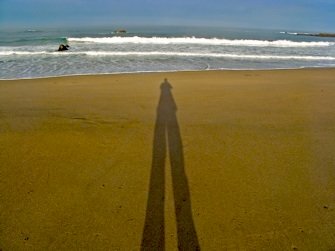 Vacation alone may offer unique chance to immerse into unknown territory where you will be a front man or woman for yourself. You will travel to heal and empower yourself. Refusal to accept yourself is at the core of your most miserable feelings. The way most people respond to difficult or uncomfortable feelings is by pushing them out, hoping that they will disappear into abyss or magically float away. As you learn more of who you are, you will know that most of your experiences good and bad ones are constructed within. When you approve of yourself, the energy required to keep the negative version or faulty interpretation of yourself real is freed and you might experience a spontaneous release into a blissful nature of who you are. This is the reason why using travel as an escape to run away from disagreeable life can't provide lasting changes of travel therapy and eventually the experience will repeat itself. Without knowledge, you may carry baggage supposedly left at departure. Accepting yourself is to stop disapproving of yourself for anything you consider "wrong with me". After you take responsibility for any behavior that affected others, accept yourself for that too. You are not the same person who committed egregious acts if you have genuine remorse and accepted responsibility for your actions. If you don't accept yourself, you insist on being the same person as you were then. If something comes up to your attention that you would like to change about yourself, accept that for what it is without holding it against yourself as a defect. Avoid investing energy in reinforcing it — give yourself approval for that part which you like to change — explore it without shame or resistance. Bring it to the light of your consciousness and look at its appearance, its function and a belief supporting it. Recognize the role it played in your life until now, thank it and release it.